The holidays don't have to be scented with just cinnamon and cloves and decorated in reds and greens! Working dried lavender's muted grays, greens and purple tones into holiday decor creates a unique twist to the look of the season. Beyond its aesthetic appeal, lavender's timeless floral aroma can be just the breath of air needed during the bustle of the holidays. 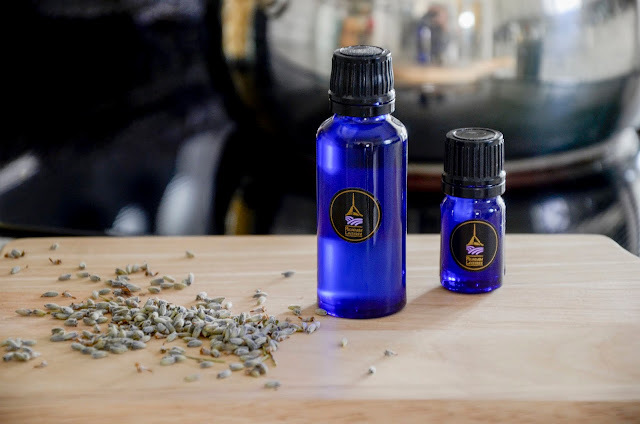 Lavender's soothing, calming, and relaxing aromatherapy attributes can be especially beneficial through the seasonal shopping and family obligations, and the stress these activities can sometimes carry with them. You can opt for a variety of textures or simply go for a modern, uniform look — the possibilities are endless! We used some fresh fir clippings (salvaged from a large branch that had recently fallen in our neighborhood! ), a bunch of eucalyptus from our florist and one of our bouquets of long-stemmed Lavandula x intermedia "Grosso" lavender flowers. 2. 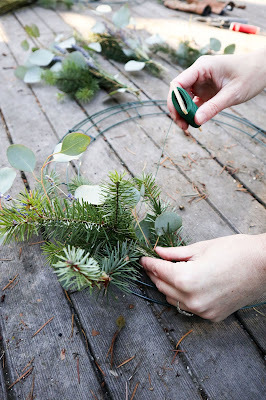 Wrap the end of the floral wire several times on your wreath form to secure the wire. 3. Unwind about 8-12" of wire and extend it toward the center of the wreath form. 4. Take 3-5 stems of your greens and florals and form a small bouquet. * You can make a bundle of all one type of green, or make a mixed bouquet - artist's choice! 5. Trim the stems. We trimmed ours to be about 8" long for our 16" wreath form, but you may clip your stems longer or shorter, depending on the size of your wreath or the style you're looking to achieve. Longer bunches will give a looser look; smaller bundles will have a more refined, tighter look. 6. 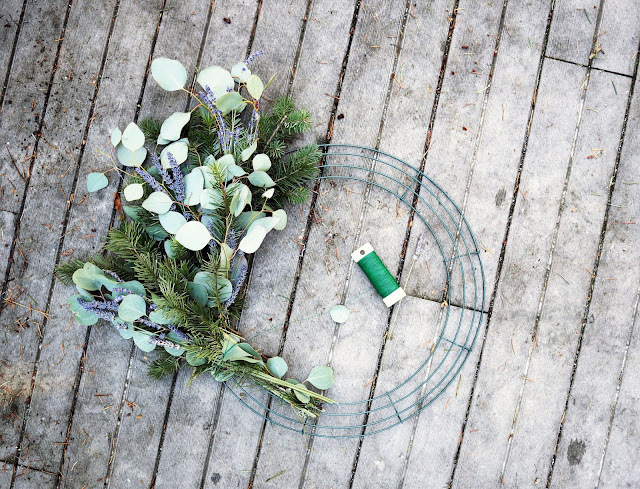 Hold your mini-bouquet against the wreath form at a 30-45 degree angle. 7. 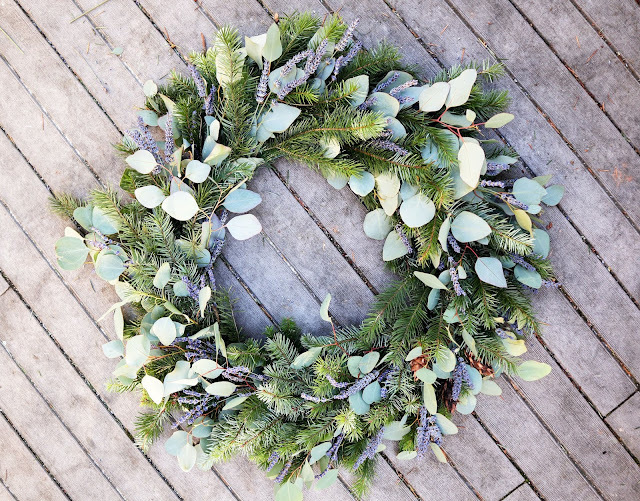 Holding the wire in one hand and pressing the bundle of greens firmly against the wreath form in your other hand, wrap the wire tightly around the form 2-3 times until the bundle feels secure against the wreath form. Do not cut the wire. 8. 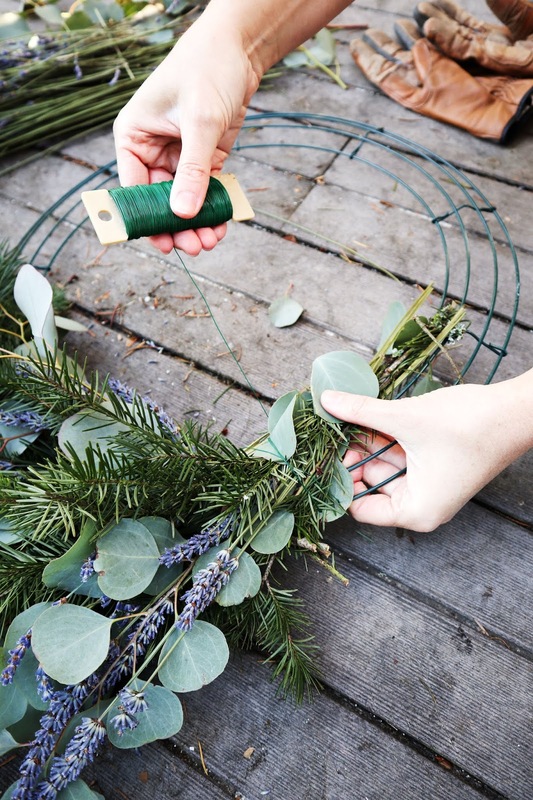 Repeat steps 3-7, positioning your new bundles over the stems and alternating the angles of each new bundle before attaching them so that they begin to cover the entire wreath. 9. When you have come to the beginning of your wreath, simply loop the wire around the wreath form as you did in step 2 to secure the wire in place. 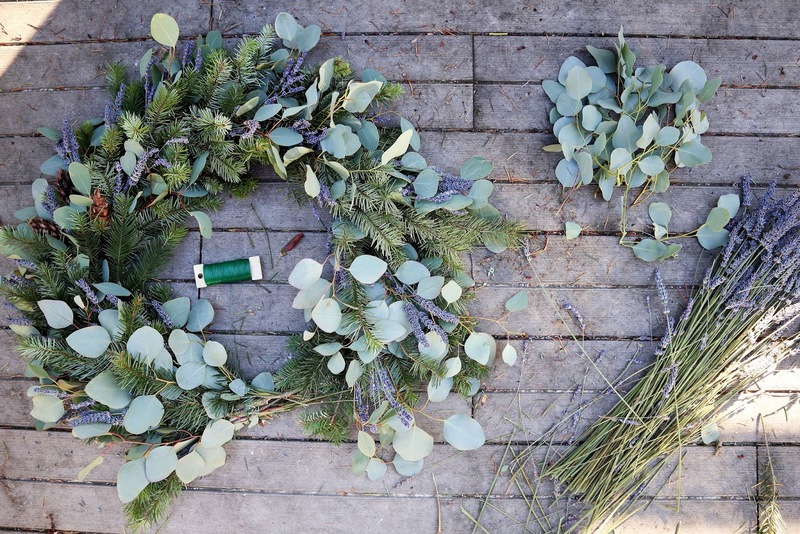 Option: if you used a twig wreath form, you may opt to make a small loop out of your floral wire at this point to create an easy way to hang your beautiful new creation! *Depending on how loose the bundle feels, you may want to secure each of your small bouquets with wire or floral tape before attaching them to your wreath form. One of our favorite things about this method is that you can re-use the wire and the form next season! 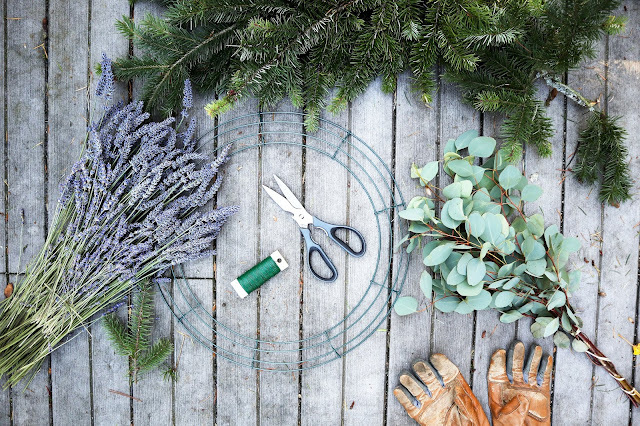 Simply unwrap the wire from your wreath form and you have a fresh frame and wire to use again next year. Waste not, want not! 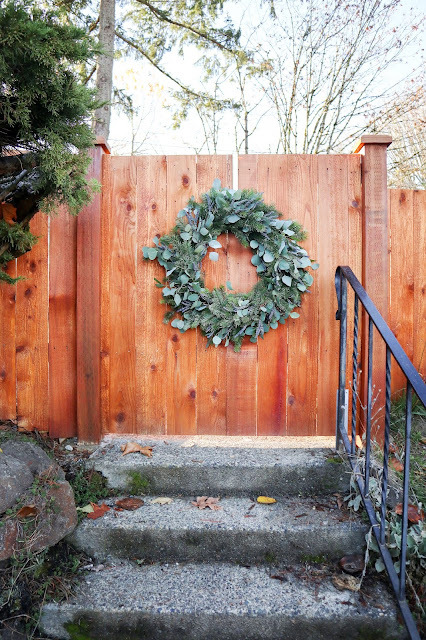 Of course, the season's demands don't always allot much time for creative DIY projects like these. That doesn't mean you have to miss out on adding lavender's beauty and relaxing aroma to your home this December. 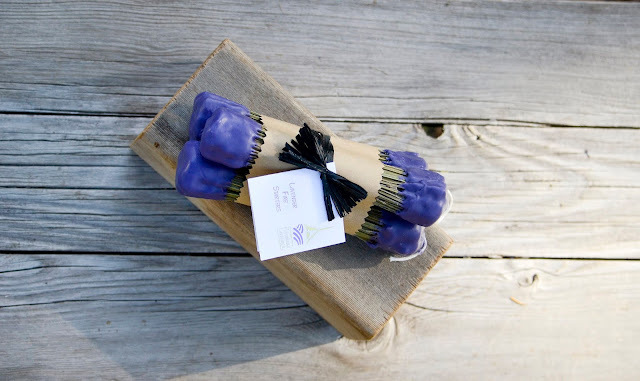 Take a peek at some of our beautifully handcrafted dried lavender creations here – or perhaps carve out some time for a decadent self-care routine with lavender instead? We hope you'll enjoy the luxurious and aroma additions of lavender to your home this joyful season. Apple pie. Does the smell, taste or mere thought of a slice of freshly baked apple pie conjure up warm memories? Let's add a flavor twist to that memory. Lavender Apple Pie. 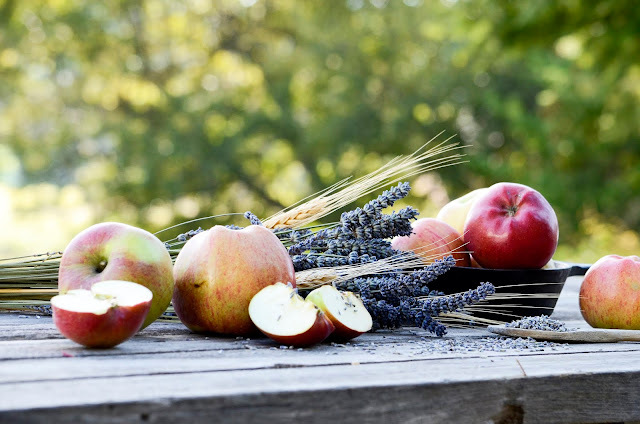 Have you ever enjoyed a slice of freshly baked Lavender Apple Pie? If not, you are missing out on a truly distinctive taste experience. 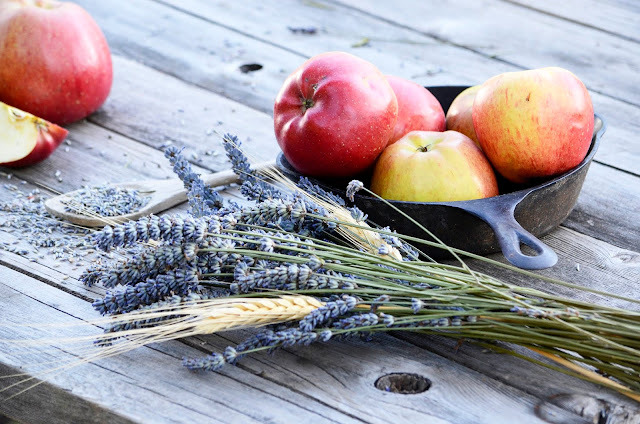 Lavender and apples pair beautifully together and bringing the two together in a pie is about the easiest thing ever. Step 1 - Prepare your favorite* Apple Pie recipe. Add 2 teaspoons of lightly ground Organic Culinary Lavender to the filling. As lavender is still a less familiar taste to our modern palate, you might find you prefer a little less or a little more than 2 tsp. Experimentation is encouraged! Finish pie as per recipe. *If you don't have a favorite Apple Pie recipe thousands of people have shared their favorites online. A simple search for "Apple Pie Recipe" will provide you with a myriad of options. For a decadent dessert service, gently warm the pie and serve immediately with a scoop of your favorite vanilla ice cream (dairy-based or non-dairy). Be sure to include a fork and a spoon! If there is any leftover (as unlikely as that may be! ), indulge in a slice for breakfast. Gently warmed with a couple scoops of plain or vanilla yogurt and a dash of cinnamon, this is wonderful way to start any day. Cooking with lavender is an adventure for both the sweet and savory sides of the palate. There is much to explore in our lavender cookbook or online lavender recipes. Whether you are an avid cook or you and the kitchen have only a nodding acquaintance, the occasional burn is par for the course – a slipped pot holder when removing something from the oven, sauce bubbling over, accidental contact with a hot pot or burner, etc. 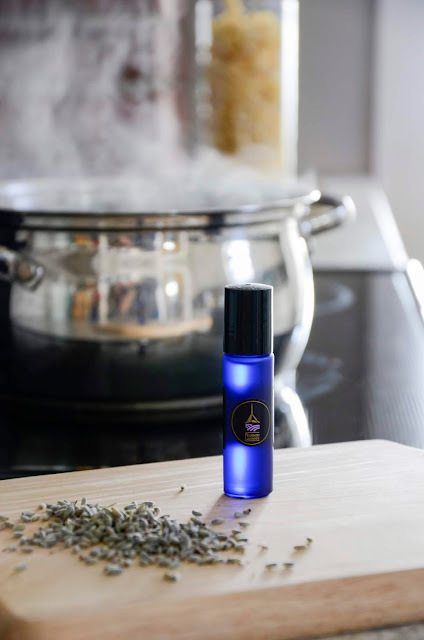 Based in its naturally occurring antiseptic and anesthetic properties, lavender essential oil has long been recognized as an effective treatment for burns. Immediate topical skin application can provide almost instant pain relief, and continued application during the healing process takes advantage of lavender's anti-scarring attributes. "One event in particular remains vivid in my memory due to the potential severity of the injury and the actual outcome. I am a licensed esthetician (skin therapist) and an aspiring home chef. I have used lavender essential oil for many years in many applications. "It was pasta night in my kitchen. A large pot of water and linguine was boiling furiously on the stove. When it came time to drain the pasta, I lifted the pot and began pouring the contents into a colander which sits across the sink. Suddenly the colander slipped off the edge of the sink and sent a generous wave of boiling water over the back of my hand. Immediately experiencing the hot, searing pain, I knew I would be feeling the effects for a while. I quickly turned the faucet to cold and placed my bright red hand under the stream. "During this moment, I recalled a particular class on aromatherapy I took during my training. I had learned of the French chemical engineer Rene-Maurice Gattefosse who severely burned his hand in a lab explosion in the 1920s. As the account goes, he dipped his hand into a vat of freshly distilled lavender essential oil immediately after the accident and healing began the next day. 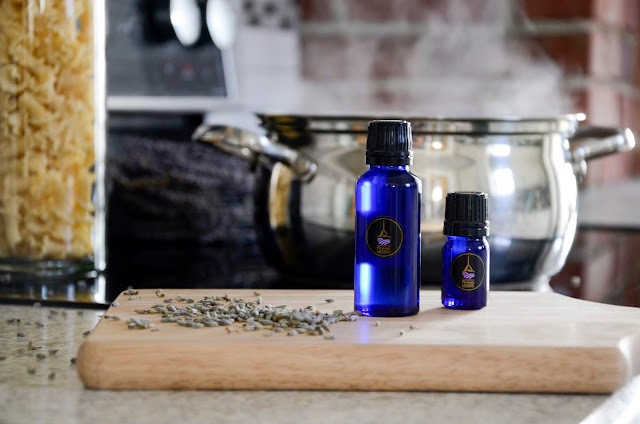 "With my hand still under the cold water I reached for my own bottle of lavender essential oil, always kept close at hand in the kitchen for its numerous and varied uses. I immediately dried my hand and applied a generous coating of the oil to the burn. Within moments the pain and burning sensations were virtually eliminated. As you may have experienced, a burn of this nature will often continue to feel hot, even hours following the injury. I did not experience this unpleasant after-effect. I applied the oil a few more times throughout the evening and suffered no discomfort overnight. "To my amazement, when I woke the next morning, not only did I experience no pain, but barely a red mark was visible on my skin! I did not develop any additional erythema (redness), edema (inflammation) or blistering, and there was no subsequent scarring whatsoever. I attribute this to the immediate and continued application of lavender essential oil to the burned skin. The power of plants is truly remarkable. "Please note, I am not a doctor and this is not medical advice. You should always seek medical help for severe burns and injuries." First there was Black Friday, then Cyber Monday... Small Business Saturday is a day dedicated to supporting small businesses across the country. Founded by American Express in 2010, this day is celebrated every year on the Saturday after Thanksgiving. 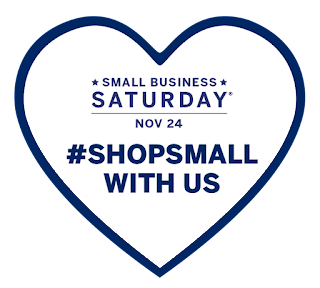 We look forward to seeing our local communities come out and support their communities by shopping small and local! 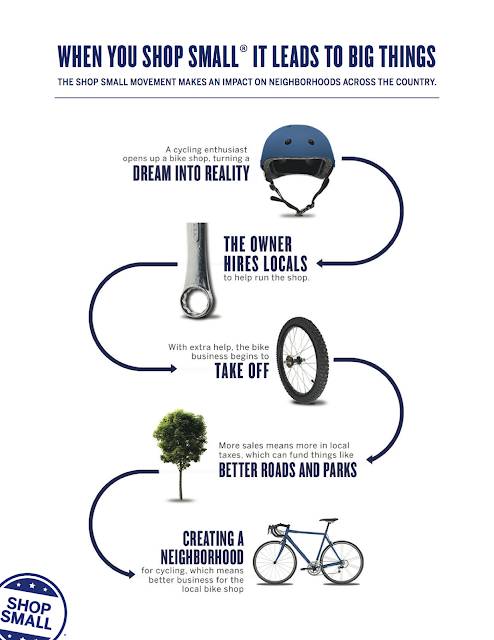 Join us for Small Business Saturday - Nov 24th at any of our many product galleries across the country to #ShopSmall! Fall is a busy season at the farm. The final harvest for lavender essential oil occurs in September and October and the distillery is in operation daily. In all this activity, it's easy to overlook the quiet processes that have been in progress for weeks elsewhere on the farm. THE DRYING OF LAVENDER. Immediately after our annual Lavender Festival, we harvest lavender for drying. Over the course of several weeks thousands of bundles of hand-harvested lavender fill our drying barn and various other buildings around the farm. Darkness and good air circulation are the keys to successfully drying lavender. We keep racks and racks of drying bundles out of sunlight to help preserve their color and regularly rotate enormous fans around the lavender to ensure consistent drying. The weather plays it's own part in the speed at which the lavender dries as well. Typically drying takes 4-6 weeks. Cool, wet weather can delay drying, while hot, windy weather will speed up the process. 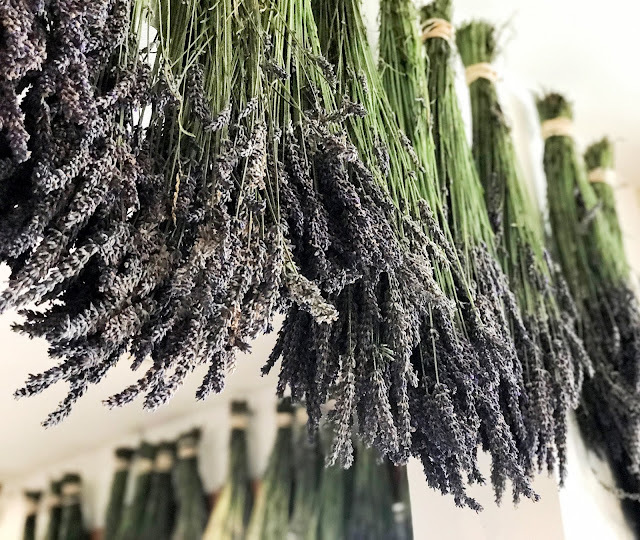 Throughout the following year until the next harvesting season we will use the dried lavender bundles to handcraft various products — the most obvious being dried lavender bouquets and lavender sachets. 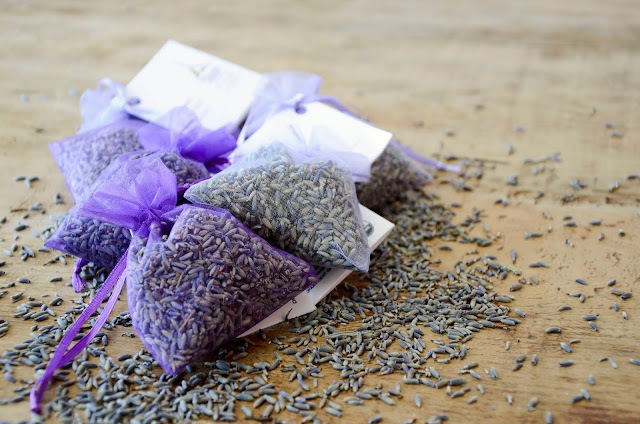 Our Organic Lavender Sachets (all of our lavender is certified organic by the Washington State Department of Agriculture) are a wonderful way to experience the fragrance of blooming fields of lavender wherever you are. Use to fragrance drawers and closets, as well as to repel moths (great for knitters) and other insects. Sachets are also a wonderful way to relieve stress at work - keep one on your desk! Tip: Once you sense the fragrance starting to dissipate, squeeze the sachet several times to release more essential oil and recharge the fragrance. Depending on frequency, one can do this for as much as a year and sometimes much longer! To create Organic Lavender Sachets, we remove the flower buds from the lavender stalks. The bare stocks might otherwise be sent to the compost pile, but that would be missing out on two wonderful ways to incorporate lavender into daily life. 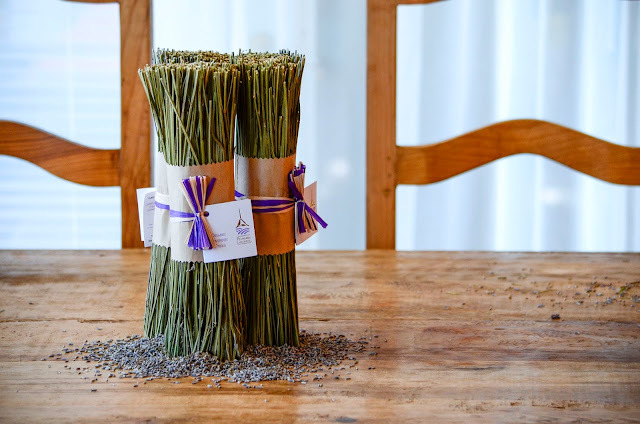 These Organic Lavender Stalks are a long-time traditional and completely natural means of improving the fragrance of a room or the flavor of grilled dishes. To fragrance a room, soak the stalks in water for a couple of hours and then throw them on an open fire to enjoy the aroma of lavender wafting through the air. To bring flavor of lavender to the grill, soak the stalks in water for a couple of hours and then throw on the coals immediately before placing fish, meat or vegetables on your BBQ grill. The stalks also work very well as skewers for grilling seafood, especially scallops. Another application (and one original to Pelindaba) is the use of the bare lavender stalks as fire starters. Excellent for use in a fireplace or wood stove or outdoor fire pit, our Lavender Fire Starters are dipped in layers of left-over soy wax from our candle production, with wick in each for convenient lighting once your firewood and kindling are set. We aim to minimize waste wherever possible. One important note for drying lavender... We secure each bundle with a rubber band. This is important because the lavender stalks will shrink during drying. If one uses twine or something similar the bundles will start to fall apart during drying. A rubber band, however, tightens as the stalks shrink, keeping the bundles intact and easier to handle.